How do I buy a market show goat or show doe from you? We sell most of our show goat wethers at auction so check our sale calendar. If you are not able to make it to our auction, you may also call and we will assist you in finding an agent to make your selection and bidding for you. 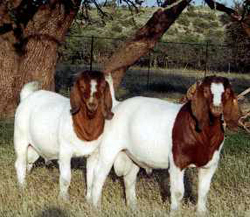 We also sell our show goat wethers at the ranch. We sell our show does at auction and private treaty at the ranch. How much do your goats cost? Our show wethers are sold at public auction so the buyers decide how much they are worth. At the ranch our show wethers start at $300. Our show does that are sold private treaty start at $400. Do you sell breeding stock? Yes, we do sell breeding does and bucks. Check out our sale catalogs for animals we are offering at auction. For private treaty sales, contact us. How do I know when, where, and what you are offering for sale? Follow us on Twitter and check our Facebook and this website for updates. We also welcome your inquires. What are you herd sires? Please click here to visit our photo album. We have two locations, south of Sonora, Texas and west of Eldorado, Texas. Drive time from San Angelo is about one hour south, from San Antonio about 3 1/2 hours west on I10. For more information, please call us at (325) 387-7046 or (325) 853-2319. Yes, we are currently accepting all major credit cards with an additional 3% processing fee added to total sale. We also accept cash, checks or money orders.